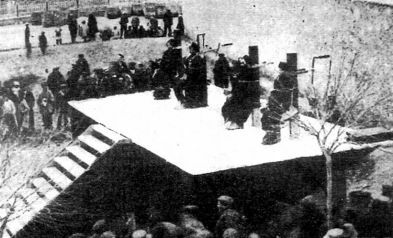 On this date in 1892, four anarchists named Burique, Lamela, Lebrijano and Zarzuela were publicly garroted on a large stage in front of the prison at the Andalusian city of Jerez (or Xeres). 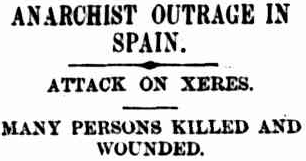 Spain, like many other European states, grappled with anarchists in the late years of the 19th century. Revolutionary peasants made the rich agricultural lands of Andalusia among the anarchist strongholds: the shadowy La Mano Negra, the “Black Hand”, had been smashed up with a number of executions in the early 1880s. This was not the end of agitation, however: its successor movement, Los Desheredades, “the Disinherited,” continued to grow. But many others would suffer lengthy, non-capital sentences on evidence perhaps more expedient than rigorous. The poet Fermin Salvochea spent most of his fifties in prison on a spurious accusation of having conspired in the Jerez attack. [The garrote] is a brass collar, which is contracted by means of a screw in the back. As the screw is turned the collar shuts upon the neck of the condemned, and at the same time the sharpened steel point of the screw enters the spinal marrow where it joins with the brain, causing instantaneous death.